Book clubbing that is. Dan has his hobby (running), and I have mine - being a member of a book club. Mine doesn't keep me in my skinny jeans, but oh well! We meet about once a month on Sunday afternoons at each other's houses (and occasionally out somewhere). It is hard to believe, but we have been meeting for three years now! A couple of ladies are missing, but here's most of the crew! 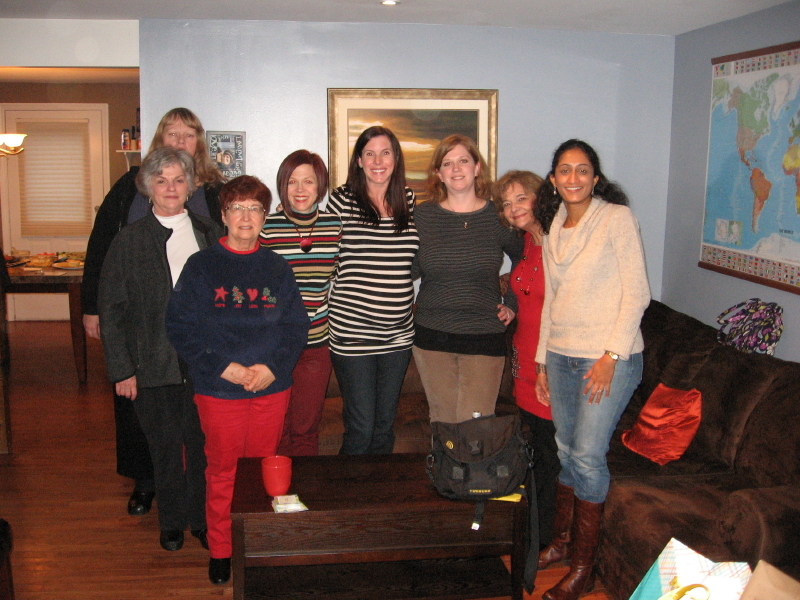 I may be biased, but I think we are pretty much the most perfect and best book club there is. We take turns choosing books, so everyone has a voice. We understand that people can't read the book everytime - either they get busy or they didn't want to finish it for some reason. So no judgment if you didn't finish (or start). Since we all have a love of reading, there are always a good amount of people who have read the book to make discussion interesting. We are also interested in each other's lives now that we have been meeting for so long and are genuine friends. Our group usually stays around the 10 person mark. We are all women, but of a variety of ages. It's great. I have been asked a number of times how the group started by people who are curious or possibly want to start their own book club. First, I tried to look for an existing club to become a part of, but I couldn't find one. So, I went onto readerscircle.org and placed an ad to start a book club. I used a new email address for it. I obsessively checked the new email address every hour for a couple of days. Crickets. I pretty much forgot about it for a couple of months. Then randomly one day, I remembered to check the email address, and there was an email from someone saying she was interested. I met up with her, and she suggested putting up flyers at a couple of the local libraries. I also pulled in a good friend of mine's sister (who is a good friend of mine on her own now! ), who loves to read. We got a couple more people from the flyers, and a couple more people from the readerscircle.org post. And it grew from there. The reason I wanted to be a member of a book club was twofold. First, I wanted to expand what I read and talk about it. Second, I wanted to meet new people. This club has met and exceeded those expectations. Having my club has been great since Ben was born. My aweome book club threw me a "book" shower, which was so sweet. Also, it has been wonderful to have some thing that is "me," if that makes any sense at all. If you are interested, here is a list of what we have read over the years. If it has an asterisk, that means that the majority of us liked it and/or it was particularly good for discussion. If it has two asterisks, then we loved it.